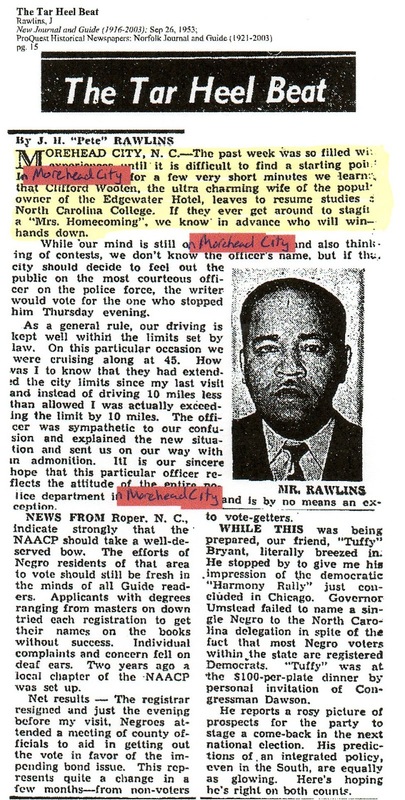 With my last post being Sunday's Obiturary: Clifford McGhee Wooten, I thought it would be a good follow up post to highlight a couple of newspaper articles I came across in the ProQuest Historical Newspapers database. Clifford and Harkless Wooten were extremely multi-talented people. They were successful business owners who owned and operated the Edgewater Hotel in Morehead City. Harkless Wooten was an accomplished chef who worked at places such as The Dunes Club, The Coral Bay Club, and the John Yancey Restarurant, all on Bogue Banks. He even worked at the Atlantic Hotel when it stood in Morehead City. Clifford Wooten managed the Edgewater while her husband worked at other establishments. She later went on to earn a bachelor's degree in education and eventually a master's degree in counseling. I am continually amazed by your "findings." Is this going to be your profession - because I am ready to hire you!